Metal monitor stand helps your computer fit into your life in function and form. 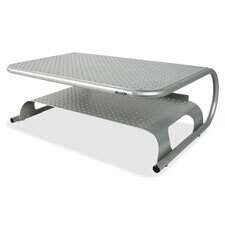 Forged from steel, it provides a more ergonomic, raised surface for your printer or monitor up to 40 lb. Metal stand features an accessory shelf to hold paper, printer cartridges and your favorite letter opener. It also creates space underneath to store your keyboard or other desktop essentials. A simple, curved design and powder-coat finish help create a balance between the comfortable feel of your home or office and the technical convenience of your computer. 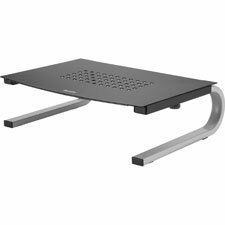 Metal monitor stand helps your computer fit into your life in function and form. Forged from steel, this stand provides a sturdy shelf for your monitor or printer up to 40 lb. It also leaves a space beneath for your keyboard or other office supplies. The compact base makes it perfect for flat panel monitors, and its triangular shape lets you take advantage of corners and odd work spaces. A simple, curved design and powder-coat finish help create a balance between the comfortable feel of your home or office and the technical convenience of your computer. Monitor stand raises most monitors and laptop screens to a more ergonomic height. Raised surface provides great storage for a laptop, random office supplies and more. The chrome-like base delivers a high-tech look and modern style to any desktop. Grate design dissipates heat to ensure a more functional computer. Mouse pad is designed to look like it came with your computer with an elegant design. 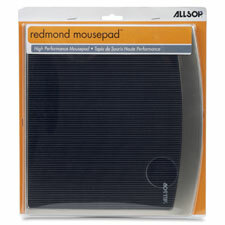 Oversized mousing area ensures precise use of your mouse and improves your cursor's response. Mousing surface is textured to give better traction for roller-ball mice and has fine tracking points for optical laser mice. 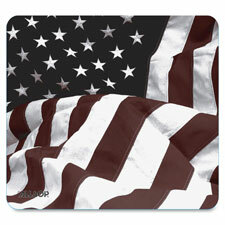 Mouse pad features a soft, cloth top for maximum comfort and better tracking for your mouse. 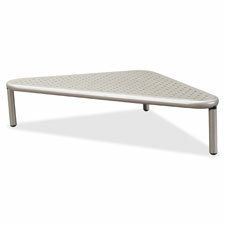 Eco-base is designed with a nonskid surface to prevent it from sliding during use. Glue-free assembly does not use or create any harmful chemicals. 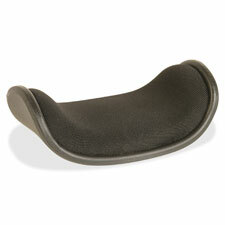 Wrist rest comfortably cradles your wrist to increase your ergonomic support when using a mouse. Memory foam contours to your wrist for a personalized and relaxed fit that's perfect for all-day use. Wrist rest guides you to create optimum hand and arm movements.